This afternoon Samsung unveiled the Galaxy Note 8 smartphone. This larger than average stylus packing device, who's ancestor started the large screen 'phablet' trend, boasts its biggest screen ever at 6.3-inches in diagonal. Samsung dubs this wraparound screen the 'Infinity Display' and claims the Note 8 still sits comfortably in one hand. Samsung's Galaxy Note devices usually pack impressive powerful supporting hardware and the Note 8 is no different. Behind the 6.3-inch Quad HD+ Super AMOLED Infinity Display sits a powerful Octa-Core 64-bit 10nm processor (varies depending upon region). This runs Android 7.1.1 out of the box backed up with a spacious 6GB RAM (LPDDR4) and your choice of 64GB/128GB/256GB built-in storage. Also depending upon region there is a hybrid SIM/microSD tray for 2 SIMs or 1 SIM and one MicroSD (up to 256GB). With your SIM in place you can enjoy very fast LTE speeds up to Cat.16, and at home or work take advantage of Wi-Fi 802.11 a/b/g/n/ac (2.4/5GHz) VHT80 MU-MIMO. It also sports Bluetooth 5.0 (LE up to 2Mbps), ANT+, USB Type-C, NFC, Location (GPS, Galileo*, Glonass, BeiDou* depending upon region). Sensors included are Accelerometer, Barometer, Fingerprint Sensor, Gyro Sensor, Geomagnetic Sensor, Hall Sensor, Heart Rate Sensor, Proximity Sensor, RGB Light Sensor, Iris Sensor, Pressure Sensor. Samsung pushes the S Pen into new realms, again. This time around it comes with a finer tip, improved pressure sensitivity, and can even be used to take screen-off memos. 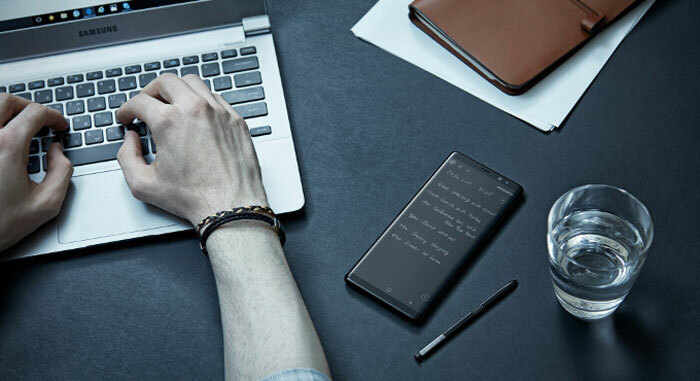 Samsung has enabled an always-on display where you can pin certain notes and even edit them while the device lays 'dormant'. Another nice S Pen feature is a new translate function where you hover the pen over foreign text and can read words and sentences (choice of 71 languages). Many new smartphones feature multi-windowing multitasking now, but I first remember it on the Galaxy Note 2. On the Note 8 the Multi Window functionality has been enhanced for the big QHD+ screen (18.5:9 aspect ratio). One particular nicety is the new App Pair feature which lets users create custom app pairings and launch them with a single tap. You aren't confined to this large yet pocketable screen. Samsung DeX enables a desktop experience which can really help with doing work on the go. Camera quality and features are quite high up on the list of desirable features for many smartphone buyers. The new Galaxy Note 8 is the first in the series to come packing one of the growingly popular dual lens camera systems. 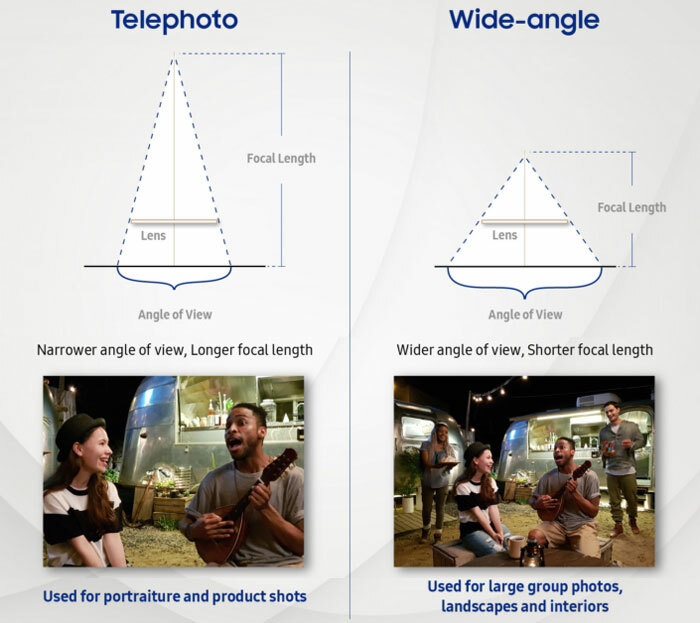 Samsung chose to implement two 12MP cameras with OIS on the rear of the phone. One of the lenses is an f/1.7 wide-angle and the other an f/2.4 telephoto (2x optical zoom, up to 10x digital zoom). Samsung leverages the twin cameras for live focus effects, dual capture mode, or just to provide more detail in regular shots. On the front of the phone Samsung has equipped an f/1.7, 8MP, autofocus, camera for your selfie and video chat requirements. It is said to provide excellent low light performance. Inside the Note 8 is a captive 3,300mAh battery which charges quickly via USB-C port. Don't worry, Samsung has learnt its painful lesson and the new batteries pass an 8-Point Battery Safety Check, "the most rigorous in the industry". On the topic of physical safety and integrity Samsung's new Note 8 and S Pen is certified IP68 water and dust resistant. The S Pen even works when the screen is wet, says Samsung. There was some uncertainty about how Samsung would equip a fingerprint sensor in the Note 8. Apparently it wanted to embed one under the screen but the technology wasn't quite ready. Thus you will find a fingerprint sensor round the back, next to the dual-camera array. Backing up that access and authorisation method are both iris and face recognition technologies. If you have sensitive / private files on your mobile Samsung offers an encrypted Secure Folder with biometric access. Meanwhile, Samsung Pass enables users to use biometrics to quickly log into web sites and so on. Last but not least Samsung Pay uses biometric security to provide a secure and convenient way to pay. The Samsung Galaxy Note 8 weighs 198g including the S Pen and measures 162.5 x 74.8 x 8.6mm. It will be made available in the all-new Deepsea Blue, as well as Midnight Black, Orchid Gray and Maple Gold. 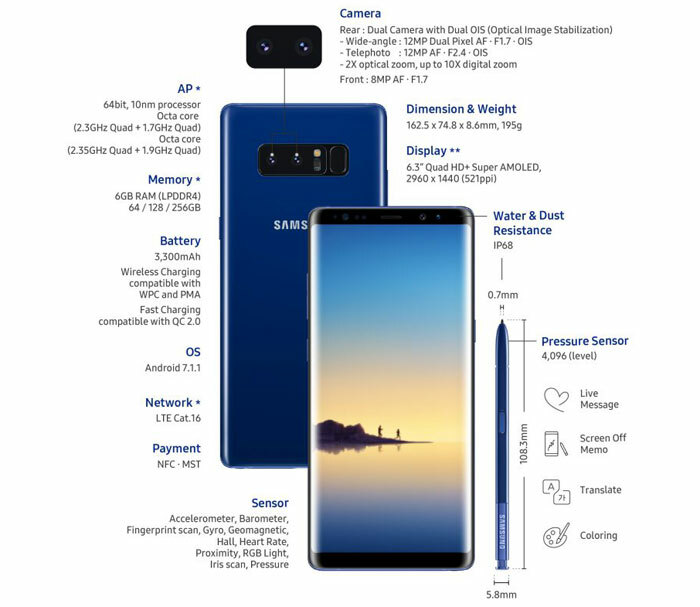 Carphone Warehouse has the Galaxy Note 8 up for pre-order already in a number of contract deals such as one with 5GB of data, unlimited minutes and texts for £49 per month for 24 months (with O2) after paying £59.99 up front. The SIM-free price at CPW is £869.00. Deliver is estimated at 15th September. Can't understand how anyone would pay that much when a OnePlus 5 is just over half the price and like 90% as good. For me, even the OnePlus 5 is expensive but much better value for money. We are close to hitting £1000 for phones and people pay these prices and then claim they are poorer. My D600 and a Moto G 3rd gen,cost less than this phone. Just,wow! £870 for a phone….think I'll pass. I don't mind spending good money, but that's just ridiculous. That's the thing, it isn't a phone its a phablet (I hate conjoined words like that, it feels too marketing approved or something). Like a micro laptop/notebook that's more than capable of making calls. If you need something between a smartphone and a tablet, you get one of these. I used to use a galaxy S2 and watched netflix and stuff on it all the time, then I borrowed an iPad briefly and couldn't go back to such a tiny screen, so I got my own tablet (couldn't bring myself to pay for an Apple) and I was very happy. Feels like such a waste buying an xperia xzp now, the screen, while brilliant, is too small to really enjoy media, there is little to no 4k or VR support. So either buy a small, cheaper functional phone and as reasonable a tablet as you can get for media, or combine both and get a phablet. I see no mention of a built in fire extinguisher or the ability to eject the battery similar to how the USS Enterprise used to eject the Warp Core when it breached.